"Think of this as a nostalgic toaster destroyer but with no sentry camping; we're gonna have a good time." A remake of a Reason 2 Die map from 2014. This has been expanded and is more detailed. After their escape from Blackfield Station, survivors found themselves within the confines of a formerly dodgy downtown of Westfield Parish - Portland. Upon arrival, the veterans marvelled at how the all too familiar city seemed larger, but they quickly realized their memories were simply being distorted through a nostalgia-tinted lens. As they took in the sights of the city they thought they once knew, everything came rushing back: the skyline their mind had ignored, the rooftops where they fitfully rested for many days and many nights, the streets where the bodies of their comrades and enemies alike had once lain. The city was a rotted place that was a mental minefield for terrible memories. Portland is a haunted city. A haunted city not filled with ghosts of people, but with the ghosts of memories that many wish they could forget. As the veterans shook their heads, readied their weapons, the growls began. Once, they would only come from in front, but as their foes evolved, so did their attacks. Above, below, in front. Their enemies had become more advanced, more powerful. As the hordes began advancing towards them and the growls of the Brutes began, the group shared one last moment of contemplation as they wondered how they would survive this town once again. A remake from the old R2D 2014 Portland map, many of the main structures has been remade, but the map overall has been expanded and has new sections the previous old 2014 map didn't have, such as the large highway bridges. Stay on high ground as there are decently tall building and structures. The Karambit or the Boosterpad can be extremely useful to access some rooftops. Due to it being rather considerably large you should stick with a team so you don't get pinned down all alone. Diggers can dig here, but only in a select few spots. Edgars and Stalkers are by far the best mobs on the map due to their mobility. If you are struggling to see the map, press "X" to activate your flashlight. One can shoot through the fences in Portland, so it is not against the rules. Use this to your advantage in Vs. Environment. This is a remake of the Reason 2 Die 2014 map of the same name. This is four times larger than the original and a lot more detailed. Quite a handful of easter eggs, see the gallery page for more information. Named in-game as Westbridge Parish, Portland. The Rescue timer on this map is 10 minutes, making playing a Rescue round for this map similar to a Survival round. There is currently a glitch that if you shoot at a specific part of the Highway Sign, they will bleed. Although not credited, GammaShock built portions of the map such as the large scale bridge and a few other areas. In the original version of the map, there was a lot of cars, as show in this picture. 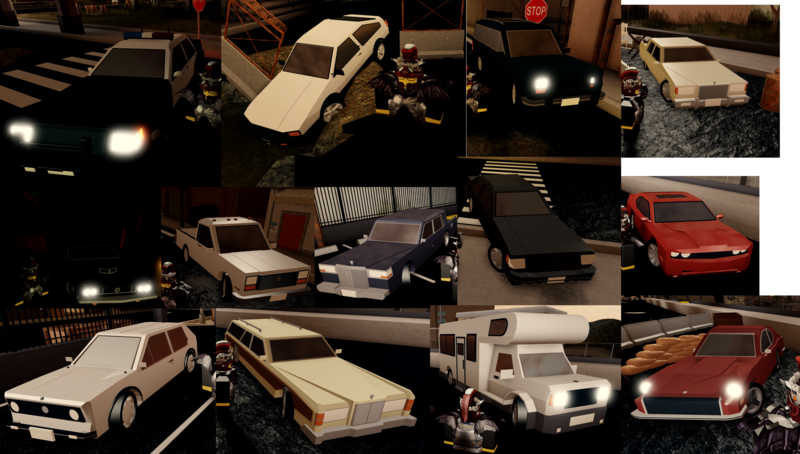 These cars were removed as they caused a lot of lag.